The Boot to Qt software stack installation provides pre-built images for the reference target devices that are listed in Reference Target Devices and Development Hosts. 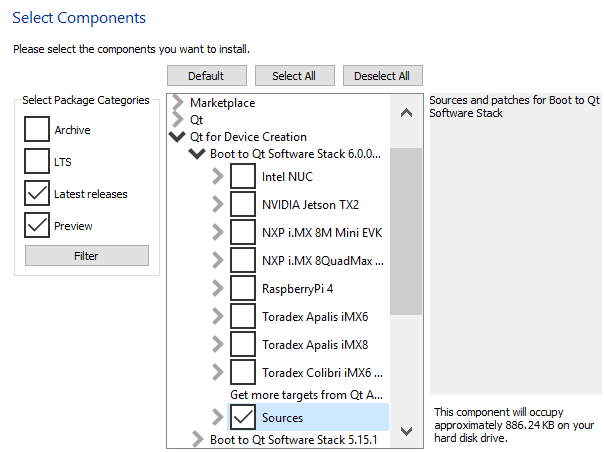 The steps in the target device specific installation guides describe how you can install the Boot to Qt software stack and how you can flash your target device with the pre-built image. See Installing Pre-Built Images. If your target device is not one of the reference devices, you can also build the Boot to Qt software stack image from sources. See Installing Boot to Qt Sources for more information how to install the Boot to Qt software stack sources. If you would like to compile your own Qt with a limited amount of features, you can install Qt Configuration Tool for that. See Installing Qt Configuration Tool. Download the online installer and follow the instructions in the installation wizard. The Select components page in the wizard lists all the components that are available for your Qt account. See Building Your Own Embedded Linux Image for instructions how to build an image from sources. Select Qt for Device Creation. You find the installed Qt Configuration Tool under <Qt installation directory>/Tools/QtConfigGui.